We need immediate calls and emails to legislators to show that there is strong support for raising the minimum wage! This week, the Democratic caucus is going to start discussion on raising the minimum wage to align more closely with the state’s base livable wage policy. But, they’ve already been hearing A LOT from opponents. That’s why we need you to call your legislator and let them know you will stand behind them if they take bold action to raise the minimum wage this session. Hundreds of Rights & Democracy volunteers and members hit the doors in last year’s elections and sent the message to Gov. Phil Scott that we would not sit by idly and watch the health and well being of Vermonters be vetoed for political gain. That work paid off last week when the House passed a paid family and medical leave insurance program by a strong 92-to-52 margin—thanks to your support in holding elected officials accountable to their campaign promises. Now, we need to urge those same House members and House leadership to raise the minimum wage to a base livable wage—$15 an hour by 2024. This is the least we can do for the tens of thousands of Vermonters who are working one, two, and three jobs to keep our economy humming. Now, we need to make sure the economy works for them, too. Puts more money in people’s pockets has a positive ripple effect on the entire economy. A higher minimum wage helps small businesses’ bottom line by giving them what they need most, customers. When our lowest paid workers have enough money to support themselves and their families, our families and communities are healthier. Women represent less than half of the workforce, but outnumber men when it comes to sub-livable wage work. Of Vermonters earning less than $15 an hour, 58% are women. Nearly half of all Vermonters in low-wage jobs have some level of college education, and more than 86% have a high school diploma. And, 62% of those who would be affected by a $15 minimum wage are older than 25. Jobs that provide low wages and no benefits place additional pressure on our social safety net, driving up costs for taxpayers and leaving families struggling just to get by. When someone earns a livable minimum wage, rates of turnover decrease because of workers stay healthier and and happier with their jobs—which means small businesses save money associated with training and recruiting new employees. 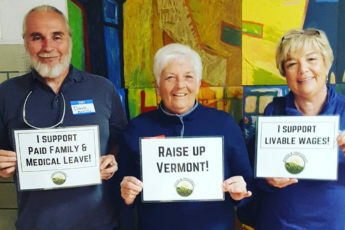 So … call or email today and remind your local legislator know that you voted for them last November so they could take the bold action needed to make our economy fair for everyone, and give a boost to our rural economy by putting money back into the pockets of hard-working Vermonters. It’s time to build a Vermont economy that works for, and support, everyone.